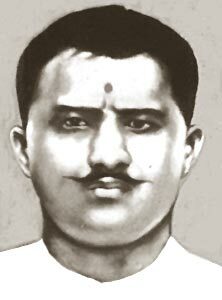 Ram Prasad Bismil participated in the Mainpuri Conspiracy of 1918, and the Kakori train robbery of 1925. Apart from being a freedom fighter, he was also a patriotic poet. Ram, Agyat and Bismil were known as his pen names which he used in Urdu and Hindi poetry. But, he became popular with the last name "Bismil" only. He was associated with Arya Samaj where he got inspiration from Satyarth Prakash, a book written by Swami Dayanand Saraswati. He also had a confidential connection with Lala Har Dayal through his guru Swami Somdev, who was a renowned preacher of Arya Samaj. Bismil was one of the founder members of Hindustan Republican Association. Bhagat Singh praised him as a great poet-writer of Urdu and Hindi, who had also translated the books Catherine from English and Bolshevikon Ki Kartoot from Bengali. Several inspiring patriotic verses are attributed to him, including the famous poem "Sarfaroshi ki Tamanna".